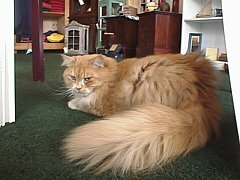 One day in the end of March 1997, while the owner of Tugboat Anne's was having lunch, two year-old Satchmo walked in to her shop, snatched some bread out of her lunch sack, and ate it right in front of her. He was so dirty and full of mats that he had to be shaved all over except for his head, his feet, and the tip of his tail. (The last hair to grow back was along his spine, so it looked like he had a reverse mohawk.) 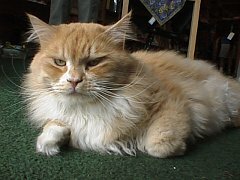 The rest of him was in pretty bad shape too: his whiskers were too short, he had scabs on his paw pads, and was way too skinny. The first month he lived in the shop all he did was eat and sleep. Probably making up for lost time. Now he's a loyal watch cat, defending the store against dogs. Once, a Rottweiler put his two front paws just inside the door. 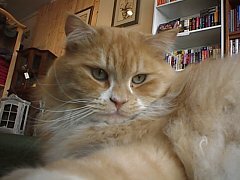 Satchmo shot off the counter, ran hissing toward the dog, and puffed himself up REAL BIG. The dog took off. Satchmo also makes his rounds around town. 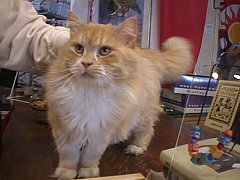 He visits other places in Gearhart, like the Post Office and the stores across the street. But his favorite place is the grocery store. He has been ejected more than once for sleeping amongst the cartons of milk in the cooler! Note: Satchmo has now moved across the street to the Gearhart Post Office, since Tugboat Anne's closed. Note: Satchmo passed away in September of 2001. We'll miss you Big Guy.